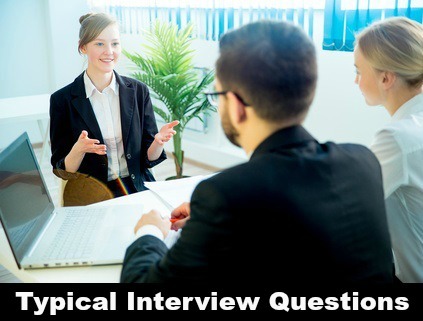 Prepare for typical interview questions. Use the answer guidelines to draft your own winning interview answers. There are certain questions that pop up in almost every job interview. These include questions about what you enjoyed and what you disliked about your previous jobs and your working relationships with your previous supervisor and co-workers. Be ready for these questions and stand out as an excellent candidate for the job. Full set of common interview questions with sample interview answers to be ready for success in your next job interview. What do you like about your current or last job? The interviewer wants to evaluate your compatibility with the position you are interviewing for. Make your answer relevant to the job requirements. General reasons such as new challenges, interacting with people, growth and learning opportunities, using your initiative, working as part of a team and meeting set objectives and goals are usually applicable to most job opportunities. Highlight the reason and make it more specific by quoting an example. "I enjoyed having to use my initiative. I have implemented and improved a number of the systems including the order processing system." What do you dislike about your current or last job? With typical interview questions like this be careful that the dislikes you talk about do not refer to specific characteristics of the job opportunity you are interviewing for. Stay away from reasons such as overtime and salary. Avoid criticism of your boss, management or co-workers. Be general and refer to the lack of or absence of what you seek in a job or work environment. "There was very little opportunity for me to use my initiative. I regard this as one of my strengths and found it frustrating that I was unable to get past the bureaucracy of such a big company to implement any improvements. That is why I am enthusiastic about working for a smaller company like this which I know encourages employees to use their initiative." "There was a lack of growth opportunities in such as small company. One of the reasons I am so interested in your company is that it is a much larger organization with formal career planning structures in place." This way you emphasize why you are a suitable candidate for this job and company as well as turning it into a compliment to the company you are interviewing with. Find sales interview answers to the interview question "What do you like and dislike about the sales job?" How would you describe your previous manager? When answering typical interview questions about previous managers avoid saying anything that can be interpreted as negative. It sends up a red flag about your attitude to authority and supervision. Even if there is something truly negative about your boss rather try to find something positive to focus on. The answer you give should be fact-based and not just your opinion. "My manager was very experienced, he had managed a number of big call centers over the past 12 years. He liked his staff to be able to work independently and I had to learn quickly to become independent about analyzing problems and finding solutions." In this answer you are stating a positive fact about your boss, his amount of experience. You are also turning a possible negative about your boss, his lack of support, into a positive about you. You have not criticized your boss and you have taken the opportunity to highlight your ability to be proactive and deal with a situation. Your definition of job success? Find job interview answers to those tough interview questions about salary, gaps in employment and lay offs. Prepare for typical interview questions that explore your competencies. Know how to handle behavioral interview questions. How to answer hard interview questions that can really test you. Preparing good interview answers and practicing before your interview is the most effective way of gaining confidence and ensuring job interview success. 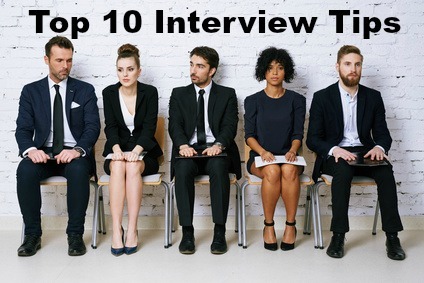 Use these top 10 interview tips to make the best impression in your job interview.